For those who’ve noticed a certain silence from my blog over the last few days, the reason is that I went eclipse-chasing. Somehow or other I managed to turn a less than three-minute eclipse into a full week trip. And it was great! 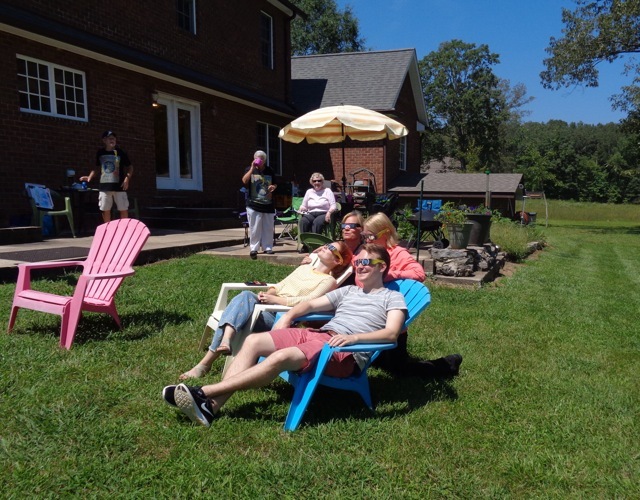 The best thing about the eclipse was that it provided an occasion for an impromptu family reunion. I went to eastern Tennessee to stay with my father and his wife, who live just outside the zone of totality. I mentioned my plans to my uncle, who said he’d like to come too. And it just snowballed from there, as we ended up with 12 members of my extended family, some of whom I hadn’t seen in years. Of course, they didn’t all stay with my father; most of them stayed at hotels. What I didn’t realize is that an eclipse is twice as much fun if you are with a crowd of family or friends! You need other people to go “oooh” and “aaah” at appropriate moments. It’s also a lot of fun if you’ve written a book about the moon and everybody treats you as the go-to source for information about eclipses. 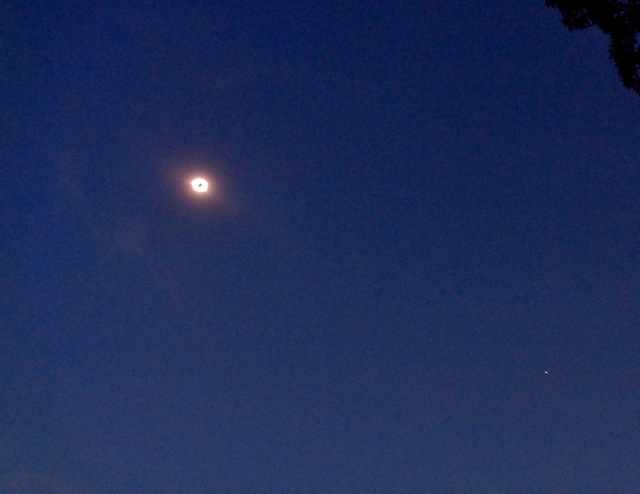 Even so, I had never actually seen a total eclipse, so it was a new experience for me as it was for everyone else. And it did not disappoint! I know it’s been said before, but the difference between partial and total is like the difference between day and night. As long as the tiniest bit of sun remains uncovered, your brain still perceives it as daytime. Of course, it’s a bizarro daytime. The light is getting dimmer, like at twilight, but the shadows are staying the same length. So your brain is actually quite confused. It’s as if you’re looking through very smoky glasses. But the moment that last bit of sunlight goes away, darkness descends and your brain tells you that it’s night. Again, it’s a bizarro night. It’s more like 30 minutes after twilight, when the stars are just coming out and the western horizon is still tinged with red. Except that now, the whole horizon is tinged with red. It’s as if you’re living in a little bubble of night, which really you are. And of course, instead of the moon, you’ve got a black disk up in the sky, surrounded by the most amazing sight of all — the sun’s corona. They call it a corona because it looks like hair. Angel hair, white and glowing and combed into spectacular waves. The waves don’t visibly move; on the time scales that we can see, they are frozen in place. The corona is as bright as a full moon, maybe a little bit brighter. It’s amazing to think that it’s actually been there, every sunny day of your life, but you just weren’t able to see it. At the very end of the eclipse, like the last three seconds, there are three more wonderful surprises. First, Bailey’s beads, the little points formed by the sun starting to shine through the valleys on the surface of the moon. Second, the chromosphere emerges — a little red band that is inside the corona, but outside the photosphere (the bright “surface” of the sun). And finally, with a dramatic flair, the “diamond ring” appears — the first rays of the re-emerging sun. Although the diamond ring is a nice analogy, it woefully understates the beauty of the apparition. If you took all the diamonds on earth and put them on a single ring, maybe you’d get something with a thousandth of the fire and brilliance of this one. Really, after you’ve seen this diamond ring in the sky, you might as well chuck your own diamond ring in the wastebasket, because it will never impress anyone anymore. So that’s the short description. Add in some beer, two kinds of gumbo, some goofy-looking eclipse glasses, some music, and some applause and cheers when the sun disappears and again when the diamond ring appears, and you have one fun party! Facing the camera are my nephew Stephen, his bride Caroline, and my aunt Patsy. Stephen and Caroline had a fairy-tale wedding at Lake Como in Italy in June, and they really are a beautiful couple. They’re at that phase when they are constantly hugging and kissing each other, and it takes me back to the days (a long time ago) when I was a newlywed. 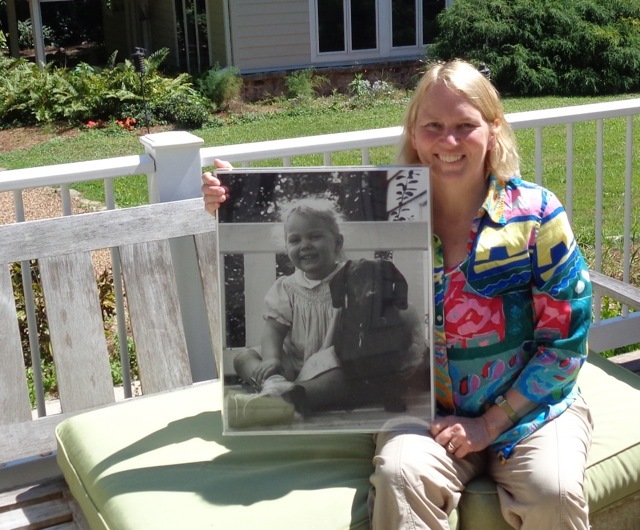 My little sister Martha, 55 years ago and today. I put this photo up on Facebook and was swamped with “likes.” Not because it’s such a great photo, but because Martha has so many friends! A typical comment was, “Martha is a compassionate, funny, and brilliant physician.” I completely agree with all three adjectives. Still, it is a nice photo, too. 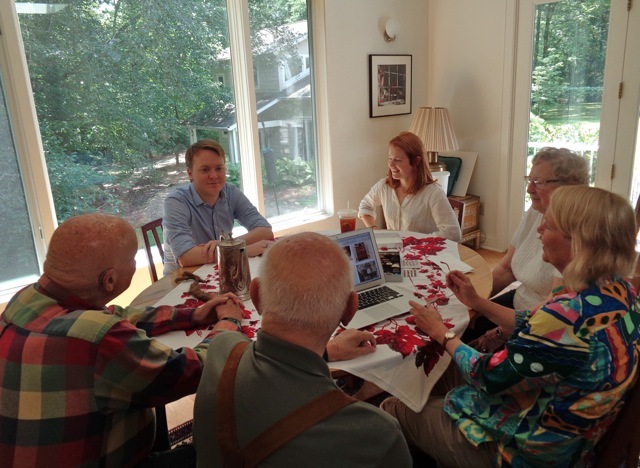 I spotted the white boards on the bench on my father’s porch, which look exactly like the white boards on the bench in the photograph (which was hanging on the wall of my father’s study). I said, “We’ve got to recreate that photo.” The only thing that’s missing is the dachshund, Fritzy, who died about 50 years ago. Now we’re on the day of the eclipse. 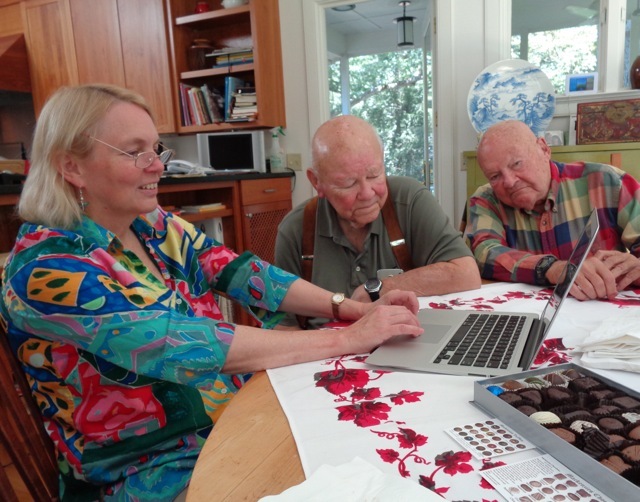 Martha, Stephen, and Walter are showing off their nerdy eclipse glasses. Of course, we all looked like nerds. I was really impressed by the eclipse glasses, by the way. They are totally opaque to everything but the sun, and they let just enough sunlight through so that you can see what’s going on very sharply, but without endangering your eyes. 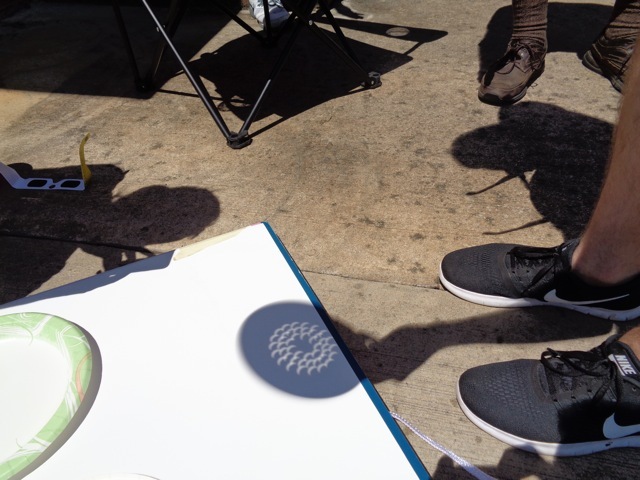 Another way to follow the eclipse in its partial stages is with a pinhole. 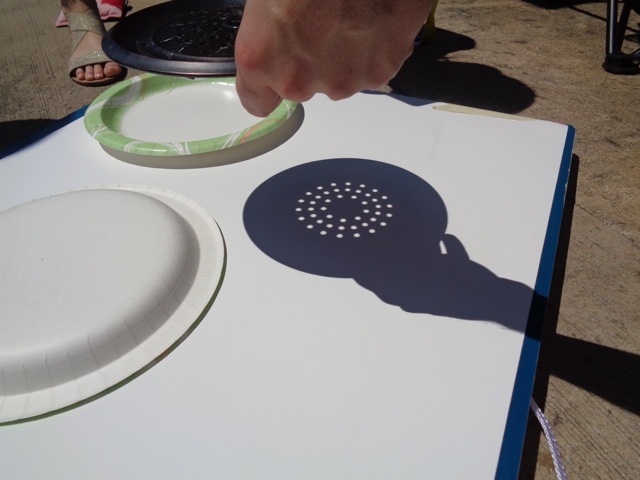 But why use a pinhole when you can use a colander instead? When it’s close to the paper, the holes look round, but move the colander farther away and you see dozens of crescent suns. Really cool! Now we’re getting really close to totality, and seeing the weird murky daylight that I wrote about earlier. The temperature had also dropped quite noticeably. When we started out, it was very hot in the direct sun, but now the sunlight seemed to have no warmth to it at all. Note also that my sister seems to have cloned herself. Actually, that’s my cousin Anna next to her. Totality! My dinky camera, with no special lenses, really can’t do it justice. However, the color of the sky is about the way I remember it, a very dark indigo. You can see Venus at the lower right, and the dark disk of the moon surrounded by the brilliant corona, like an eye in the sky. The ghostly beauty of the corona does not, however, show up in this picture; you just have to take my word for it. Just before totality there was a jet plane flying toward the sun, and I thought, “Those passengers are so lucky to be flying through at just the right time to see the eclipse!” Then, of course, I realized, that the jet must be following the eclipse on purpose. So those are my pictures! 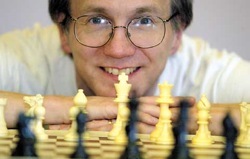 I hope that the off-topic post wasn’t too boring; we’ll get back to chess in my next post. For anyone in the U.S. who didn’t see this eclipse, you’ll get another chance in 2024. Actually, that one will be slightly better than this one. It will last longer (3½ minutes rather than 2½) and the sky might get even darker because the earth will be deeper into the moon’s shadow. The path of totality will run from Texas to Maine, so start planning your trip accordingly! There were two jets following the eclipse’s path, in sequence, so they could get an extended film of the event. The first one picked up the chase in Illinois, the second one took on the chase in Tennessee. The moon’s shadow was moving much faster than the jets could fly, so they only got about 8 minutes of film from each jet. You probably saw the second jet. Or perhaps you just saw a common commuter jet that happened to be in the sky at the same time. Fellow Stean Punk Richard Robinson was in a plane traveling to PA at the time of the eclipse, and he and his family saw a little bit of it from the air. The moon’s shadow was traveling across the US at a rate of 1800 mph. I wonder how fast the 2024 eclipse shadow will be moving, given that totality will last longer and that the path is much more of an arc than this year’s nearly straight path. Anyway, great post and thanks for sharing. My 62% experience in So. Cal was good, and as you said made better by making it a communal experience. I went to a local park where the rangers were having exhibits and displays for the kids, and the Native American representatives (this was at a Chumash cultural center) were singing songs and telling stories. Finally, I’m about halfway through “The Big Splat” and am enjoying it greatly! 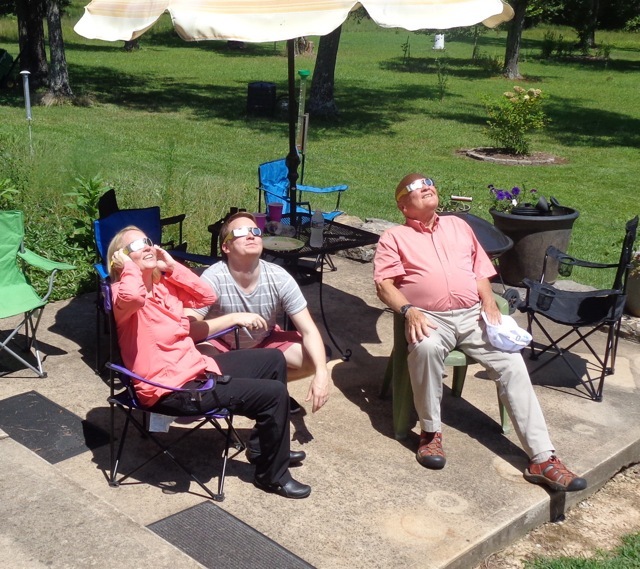 Very nice story about getting together with your family and about the eclipse. Next post: Great Defense or Bungled Offense?